nstead of turning down the thermostat on the way to bed and again on the way out the door, you can cut home-heating costs and count on a reliable, comfortable temperature with one of today’s program­mable thermostats. Basic models ($30 and up) store different settings for weekdays and weekends. More advanced models ($90 and up) store a different program for each day of the week. Whether a thermostat is manual or program­mable, your savings result from the setback, or the reduction in temperature from the typical occupied setting. 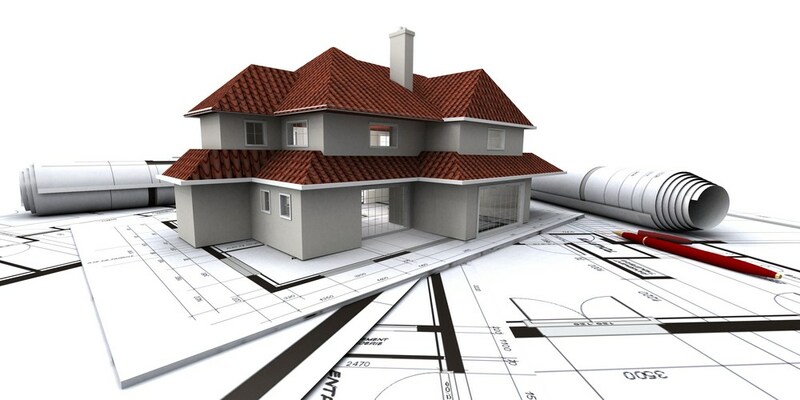 Studies by the U. S. Department of Energy have found that the energy required to raise a home’s tempera­ture to its normal level approximately equals the energy saved as the temperature falls to the lower setting. For each degree of setback over an eight-hour period, you’ll reduce energy consumption by 1%; the longer the setback, the more energy savings you enjoy. on cooling costs with a setting of 78°F to 85°F when you’re out or sleeping. A programmable thermostat has to be com­patible with your HVAC system. Be especially careful when choosing one for use with heat pumps or radiant floors. A temperature setback in heating mode can cause a heat pump to operate inefficiently. And because high-mass radiant floors are slow to lose and gain heat, temperature setbacks have to be timed differently. Finally, look for an Energy Star rating, which ensures the thermostat is capable of four daily temperature settings and is pre­programmed for efficient operation. The flexibility of a high-end model like Honeywell®’s Vision Touch Screen allows you to enter a different sched­ule for each day. The touch screen relies on a menu-driven program similar to an ATM. A feature called “adaptive intelligent recovery sys­tem” tracks heating and cooling periods over time to “learn” how long it takes to bring your house to the programmed temperature, minimizing the system’s run time. 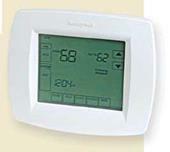 The “auto changeover” setting of thermostats in this price range switches between heating and cooling modes automatically. tems are wired differently; a professional can advise you on the best approach for your setup. transformer in the unit and the new ther­mostat. Remote thermostats for electric baseboards are typically line voltage (either 120v or 240v). In that case, be sure the thermostat you’re installing is made for line voltage, and be sure the power is off to protect yourself. • Remove the old thermostat body from its base. It will either be a press-fit unit or be held together with screws. The leads from the thermostat cable usually are at­tached to terminal screws on the base. cable was used, the colors usually match up: red lead (wire) to the terminal marked "R," green lead to "G," yellow to "Y," and white to "W." By convention, the red lead is the power supply, green controls the air mover or blower, yellow controls cooling/ air-conditioning, and white controls heat. The simplest programmable thermostat typically has two R-terminals: RC for power from the cool transformer, and RH from the heat transformer. If your cable has only one R lead, connect it to one of the two R terminals, and leave or install the provided jumper wire between the two. If the color of the wires doesn’t match the terminal designation, use masking tape to label each wire before you disconnect it. about 3/8 in. For a screw terminal, I usually strip about 11/2 in. off each wire and cut off the excess after I’ve tightened the screw. new base, and fix the base to the wall with a suitable anchor. Insert each wire into the terminal clamp, or wrap each wire around its terminal clockwise so that tightening the screw closes the loop. Make sure there’s no insulation caught under the clamp or screw. If the cable is so short that I can’t make the new connections or if I want to relocate the thermostat, I splice on a length of new cable. For low-voltage wir­ing like this, no junction box is needed. I use a crimp connector or small wire nuts, and I tape or cable-tie the two cables to­gether to take the strain off the splices. • Before you complete the installation, plug the cable’s hole in the wall with caulk or non-hardening putty. This keeps drafts inside the wall from influencing the thermostat. • Run the thermostat cable to an interior wall close to the return-air location and out of direct sun. • Keep runs of low-voltage cable at least 2 in. away from line-voltage cables. Use 6-conductor, 20-gauge standard thermostat wire unless you are sure that your HVAC unit and thermostat need fewer wires. through a 3/8-in.-dia. hole in a 1×6 block affixed to adjacent studs, flush to their faces. Make a service loop by leaving 2 ft. of cable in the stud bay, taped to the side of a stud. • Wrap 6 in. of cable around a nail driven partway into the block. This helps to keep it from being buried under drywall. Sean Groom is a freelance writer in Bloomfield, Conn. Mark Eatherton, a heating contractor in Denver, provided technical information. “Installing a Programmable Thermostat” is written by Clifford A. Popejoy, a California electrical contractor. Go back to step 1 and reduce the size of the mechanicals. An airtight house with insulation on all six sides of the cube and good windows provides predictable performance, so the mechanical contractor won’t have to guess at the quality of the en­closure. Downsized mechanical equipment can defray the cost of steps 2-5. Solar hot-water systems involve a fair amount of labor-intensive planning and plumbing, but a typical collector installation is fairly straightforward. 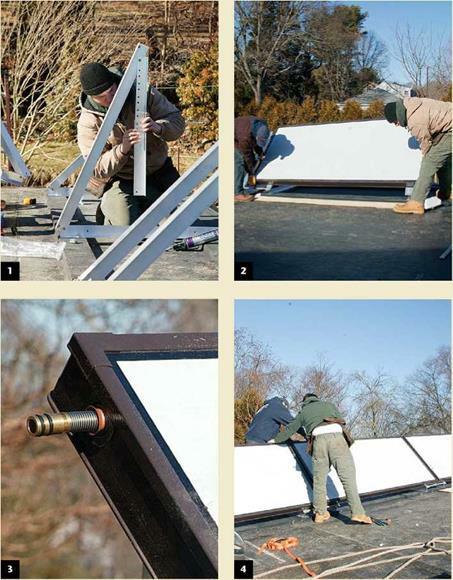 On this membrane-covered shed roof, (1) the first step was to erect the alumi­num frames that hold the panels. The frames are adjusted to a fixed angle that maximizes the collector’s solar gain and are bolted to blocking that has been integrated into the roof. (2) The panels, which weigh about 100 lb. each, are carried up and clipped onto each pair of frames. (3) Simple compression fittings connect the panels to plumbing. (4) The installers added two more panels and finished in about half a day. They spent another two days setting up the system. everyone. State and utility rebates, however, vary. Where they are generous, such as in California or Hawaii, you can expect robust growth for the solar industry. Originally due to lapse in 2008, the fed­eral tax credit has been extended for eight years. However, the on-and-off nature of government support is a "travesty," says Collins, and a chronic problem for the solar industry. "You can’t do this with stops and starts," he adds. "It’s been the history of incentives for renewables for the past 25 years." be enough to make people think about it, but to not want to make that investment. If you have incentives that can bring down that first cost, you see good market penetration." Still, credits and incentives are available now, and they make a much bigger differ­ence proportionally for hot water than for photovoltaic systems. "You displace roughly 2kw of energy with your water system, so it’s like putting a 2kw PV system on your roof," says Collins. "But it’s hot water. A 2kw sys­tem of PV might be $20,000, but a 2kw solar hot-water system might be $6000. 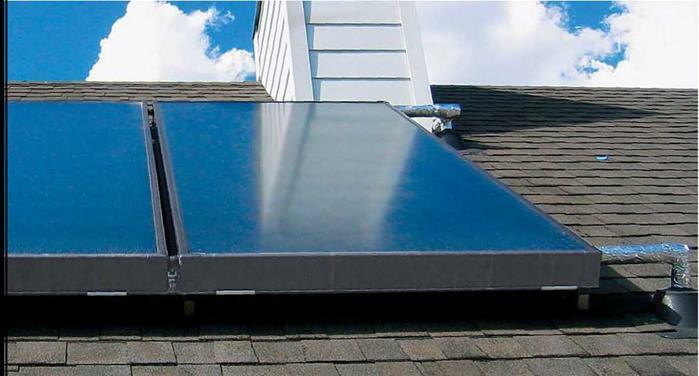 I’ve often said that solar hot water is the most misun­derstood bargain out there." Scott Gibson, a contributing editor to Fine Homebuilding, lives in East Waterboro, Maine. systems. In Europe, says Tim Merrigan of the National Renewable Energy Laboratory in Boulder, Colo., package systems that do both are relatively common. But due to heavy winter-heating loads and reduced solar potential, homeowners in this country shouldn’t expect to get much more than one-third of their winter heat from solar sources with today’s technology. Elia Kleiman, the president of Synepex Energy in Cambridge, Mass., says the pro­portion of winter heat from solar depends on the type of heating system, the amount of insulation installed, and the tightness of the house. A best-case scenario in New England, land of snowy winters and cold, dreary springs, is that a solar system meets 40% to 70% of the heating load. That’s in a well-sealed house with a radiant-floor heat­ing system. Radiant-floor heating is especially well suited to solar hot-water systems because it requires lower water temperatures, 120°F versus the 180°F that would be pumped through a typical baseboard hydronic sys­tem. Solar hot water also can be used for newer forced-air systems that use a technol­ogy called "hydro air." These boilers heat water forced through a heat-transfer coil, where it warms outgoing air. For a hypothetical house of roughly 2,500 sq. ft.—well insulated and well sealed—Kleiman says Synepex would prob­ably recommend eight evacuated-tube col­lectors covering roughly 400 sq. ft. of roof. That would provide 100% of domestic hot water in addition to what the system sup­plied to the space-heating side. ost is a key consideration when weighing the value would increase by as much as $3,690, merits of renewable energy, not only because the my annual utility savings would be from $224 to systems tend to be expensive, but also because they $335, and I would remove 21 tons of greenhouse force us to think about energy in an entirely different gases from the air. That’s the equivalent of way. A conventional water heater doesn’t cost much, 42,000 auto miles. but it’s expensive to operate over its lifetime. A solar Years to break even? Between three and four, hot-water system is much more expensive up front but not including the system’s impact on property-value costs less to use. appreciation. If I wanted estimates, a link would Thinking in generalities isn’t helpful when it comes take me to a list of local installers, complete with to deciding whether solar hot water is a reasonable contact information, services offered, and a brief investment. For specifics, I went to www. findsolar summary of their experience. provides a variety of other useful links. came up with the size of the system I’d need, length 4. In Daytor1, Ohia the savings are about Ию same as of payback, annual utility savings, and even return on in Pensacola (about $85 per year). investment. If electricity rates increase more in the future than 1. In southern Maine, I’d need one collector of about now forecast solar hot water wiN become a viable 32 sq. ft. to produce the 35 gal. of hot water my option for more people. Until then, when it comes to wife and I would use in a day. Having the system saving money with solar hot water, rt seems that if you installed would cost about $3,500, but after a have high utility rates, you’d be smart to get a system state rebate and the federal tax credit, the net cost on your roof. If not the decision depends on your com – would be less than half that. Moreover, my property mitment to a cleaner environment. 4-4.5 4.5-5 5-5.5 5.5-6 6-6.5 6.5 Renewable Energy Laboratory. In active systems, electric pumps speed circu­lation to reduce heat loss. 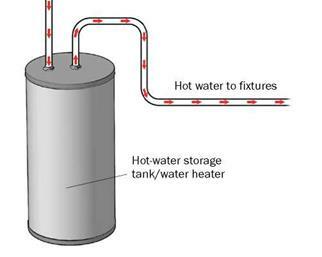 As illustrated here, water is run through flat-plate collectors (essen­tially heat collectors plumbed with a network of copper pipe) to the water heater. In areas sub­ject to occasional freezing, an optional valve drains water into a secondary storage tank when its temperature approaches 32°F. The Alternative Energy Store® (http://home. alten ergystore. com) sells an open-loop kit consisting of two large flat-plate collectors, hardware, and pump for about $3,600. Shipping and installa­tion are not included. might expect to see solar take care of only 20% to 40% of the heating load. A big drawback of trying to heat a house with solar hot water is that demand is high­est when the heat potential of the system is lowest. On an overcast day in northern New England, the sun is long gone by late afternoon, and the call for heat goes up ac­cordingly. The answer is to store hot water generated during the day in storage tanks so that it can be used for heat when the sun goes down or when the days are cloudy. Tanks can be very large, 2,000 gal. or more, although Kleiman says newer systems can use much smaller tanks that hold as little as 200 gal. tal project in Canada where solar collectors are used to heat the ground when solar potential is abundant in summer. 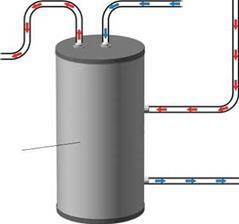 In winter, geothermal heat pumps can be used to ex­tract the stored heat. This seasonal storage of heat is one idea that could make 100% solar heat possible in the future—even in Calgary, Alberta. How Much Hot Water Do You Need? have no trouble delivering that kind of volume, but there aren’t any safe generaliza­tions about whether it will be enough to satisfy household demands. "The thing with hot water is that there are wide variations in demand," says Brad Collins, executive director of the American Solar Energy Society. "A 3,000-sq.-ft. house occupied by two elderly people will have substantially less demand than the exact same house next door that has five people, including two teenage girls. Their demand is tenfold what it is in the other house." est, whether use comes all at once (morn­ing showers, for example) or is distributed throughout the day, the number of appli­ances in the house and when they are used, and the amount of solar potential the house has. "It’s a different environment for each and every house," says Collins. "It’s very much occupant-driven." If there’s such a thing as an average, the Arizona Solar Center estimates that a solar hot-water system should be able to deliver 100% of hot water in the summer and about 40% on a year-round basis. Performance var­ies by region. A household of four people would need 40 sq. ft. of collectors for an 80-gal. tank in Arizona, 55 sq. ft. in South Carolina, and 106 sq. ft. in Vermont. How this translates into savings on gas or electric bills is also a wild card. Most solar hot-water systems are used to heat water before it goes into a conventional water heater, not as an outright replacement for a water heater fueled by gas or electricity. Careful consumers who are flexible about when they use hot water will see more solar benefit than a family that wants a lot of hot water all at once. Under the right circum­stances, virtually all of a household’s hot – water needs can be met by a solar system. "It’s like buying a Toyota® Prius®," says Collins, likening an investment in solar hot water to owning one of Toyota’s hybrid cars. "You change the way you drive because it’s rewarding. You see how your involve­ment can impact your miles per gallon. In the same way, your involvement can im­pact how much energy you’re going to be charged for, whether it’s thermal or electrical energy. People become energy literate and smart energy consumers." er, came up with the first commercial solar water heater. His patented Climax Solar Water Heater, which sold for $25, was a hit. Florida brought the solar hot-water business to its knees. is offering more-dependable, better-designed hot-water systems that give homeowners in all parts of the country a reliable way to cut energy bills. Heating water with the sun can be pretty simple. In the right climate, a 55-gal. drum painted black and perched on the roof pro­vides plenty of hot water. Collectors like that, called batch heaters, are producing hot water all over the world. But technology has a lot more to offer these days, making solar hot water feasible for any region of the country and for just about any application, from swimming pools and hot tubs to do­mestic hot water and even space heating. 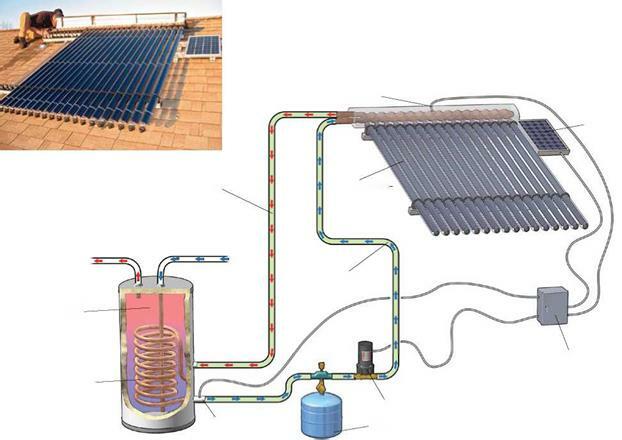 Although solar hot-water systems vary widely in design and complexity, they share some basics. The sun heats water, or another liquid capable of transferring heat, in a col­lector. Specialized materials called selective coatings are made to absorb available solar radiation. They include black chrome, black nickel, and aluminum oxide combined with nickel or titanium nitride oxide. Once water is hot, it’s either moved to a storage tank or piped directly to where it’s needed. That much seems simple, but the trick is making sure the water doesn’t cool down too much or, worse, freeze. To cover the wide range of temperatures and solar potential that hot-water systems can encounter, manufacturers offer a variety of equipment and plumbing options. In their simplest form, these systems consist of a batch collector (also known as integrated collector stor­age, or ICS) that’s pressur­ized by the household-water supply and exposed to the sun. When a hot-water tap is opened, water is forced from the batch collector to a conventional water heater or directly into the distribu­tion system. Relatively easy to install, these systems are suitable only for warm – weather areas. Solar Direct (www. solardirect. com) sells a passive-system kit for about $1,400. water in a heat exchanger. In virtually all cases, solar-heated water is routed through a conventional water heater, where it gets a temperature boost (if necessary) before being distributed to its point of use. • The Energy Star label. Energy Star- qualified dishwashers are at least 41% more energy efficient than the federal minimum. Keep in mind that some mod­els exceed the standard significantly more than others; check the EnergyGuide label or the list of qualifying dishwashers at www. energystar. gov for high-performing machines. • Soil sensing. With this technology, "fuzzy logic" is used to determine how dirty the dishes are. Water use and wash cycle are adjusted accordingly, saving significant water and energy. • No-heat drying. 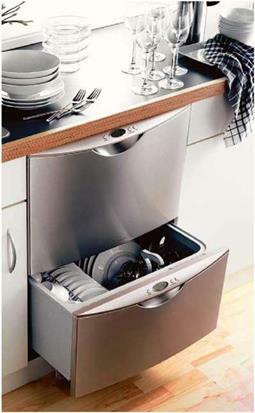 Most dishwashers have an electric heating element and fan for drying dishes. Make sure the one you buy has a no-heat drying option, which can save a significant amount of energy. • Insulate hot-water pipes from the water heater so that water stays hot all the way to the dishwasher and doesn’t cool off as much between the different wash and rinse cycles. • Wash full loads only, even if it means waiting a day or two. • Avoid high-temperature cycles. Many dishwashers have a setting for more inten­sive cleaning in which the temperature is boosted, which can significantly increase electricity use per cycle. To conserve energy, don’t use this setting. Alex Wilson is founder and executive editor of Environmental Building News and president of BuildingGreen Inc. in Brattleboro, Vt. (wwwbuildinggreen. com). His latest book is Your Green Home (New Society Publishers, 2006). Dishwashers have changed quite a bit in recent years. They use a lot less water, which translates into lower energy use for water heating. In 1978, water use by dishwashers ranged from 11 gal. to 15 gal. for a normal dishwashing cycle. By 2000, that usage had dropped to 6 gal. to 10 gal. As water use has gone down, total energy use has also dropped, while the proportion of energy use for processes other than water heating has risen. In 1978, 83% of the total energy use for dishwasher operation was for heating water; 10% was for motor opera­tions, and 7% for drying. By 1994, energy use for water heating had dropped to 56%, according to a 2003 Virginia Tech report. However, that does not mean most dish­washers are as energy efficient as they could be. Nearly all dishwashers today have boost­er heaters that increase the temperature of incoming water to about 140°F to improve wash performance. An integral electric ele­ment provides this heat, and it can use a lot of electricity. Recent independent testing shows that booster heaters operate through­out the dishwashing cycle, resulting in total electricity use per cycle of 2.0 to 3.5 kwh. Used an average of 215 times per year (the frequency DOE assumes), a dish­washer could easily consume more elec­tricity annually than a refrigerator. More research is needed to determine the signifi­cance of this electricity use. Dishwashers vary considerably in their energy use, much more so than refrigerators. For comparison, dishwashers are rated by the federal government according to their energy factor (EF), a measurement based on the energy usage for an average number of cycles (a completely different formula than the one used to rate cooking appliances). The higher the EF, the more efficient the dishwasher: The current federal standard mandates a minimum EF of 0.46; Energy Star dishwashers must meet a minimum EF of 0.65. 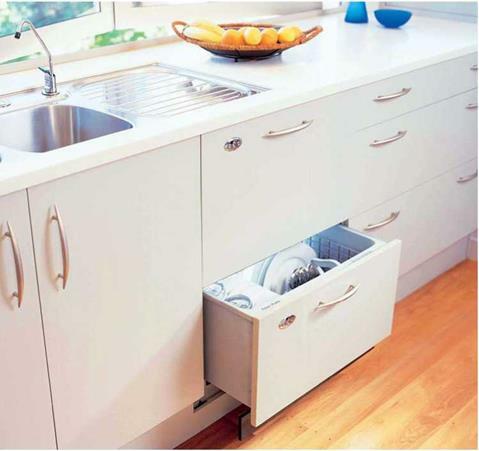 The most-efficient dishwashers have an EF that approaches or slightly exceeds 1.0. Although the EF is used to compute the annual energy consumption and cost estimates found on the EnergyGuide label on many appliances, the EF itself might not appear there. 5 times as energy efficient as standard elec­tric ovens and more than 10 times as energy efficient as gas ovens. Increasingly, manufacturers are combining cooking functions with microwave ovens to produce a new generation of "rapid-cook" appliances. These models combine micro­waves with electric grilling elements so that food can be browned as well as cooked. Quartz elements are often used to create ra­diant heat, though General Electric’s Advan – tium® microwave oven (www. geappliances .com) uses a halogen-lamp element. Convec­tion is another feature offered by the Advan – tium and some others, such as TurboChef®’s Speedcook Oven (www. turbochef. com). In the future, most ovens likely will include multiple heating options to speed up cook­ing and to serve a wider range of functions, from defrosting to reheating to grilling. If you use a convection oven, keep the lid off a casserole dish. Otherwise, it will cook no more quickly than in a standard oven. 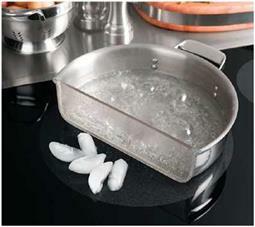 On a cooktop, closing the lid on a pot will retain heat and reduce energy use. Slow-cooking, plug-in crock pots offer an energy-efficient way to cook soups, stews, and other dishes. Exhaust fans add to energy consumption, but their importance with regard to kitchen air quality—and the health of your home’s occupants—cannot be ignored. Chemical impurities in natural gas, along with incom­plete combustion, can result in dangerous levels of carbon monoxide (CO), causing headaches and fatigue at low levels and, at high concentrations, death. Because of this concern, gas ranges should be installed with quality, outdoor-venting range-hood fans, which should be operated when the cooktop or oven is on. Exhaust fans are most efficient when placed above the cooktop or range. Down­draft fans, which are installed at the back or in the center of a range, rely on signifi­cant airflow (and power consumption) to ventilate cooking fumes effectively. Because fumes are more easily channeled into a fan installed in a range hood, fan performance is better. If you can’t vent an exhaust fan outdoors, avoid the use of gas cooking appliances. Recirculating range-hood fans can remove odors but should not be relied on to remove combustion gases. A significant energy-saving feature to look for in a range-hood exhaust fan is a variable-speed motor. This allows the fan to operate at a lower airflow rate when full ven­tilation capacity is not needed, thus saving energy and reducing noise. More efficient cooking saves energy and money directly, of course, but by keeping waste heat out of the kitchen, it also saves on air-conditioning. Although this impact might not be huge in a typical home, it can make a difference. As a rule, electric cooking appliances are more efficient than gas-fueled ones. But the relative price of natural gas versus electricity often makes natural-gas- fueled appliances a more economical choice. 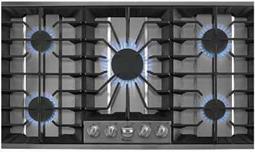 Gas cooktops also afford better heat control than their electric counterparts. Because their functions are so different, it’s important to consider cooktops and ov­ens separately, even though they might be combined in a stand-alone kitchen range. With ovens, rapid heat-up and cooldown aren’t as important as with cooktops, mak­ing electric ovens more competitive with gas, even for serious cooks. 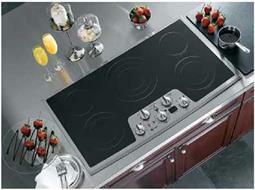 In fact, it is not uncommon for high-end ranges to have a gas cooktop and an electric oven. Again, electric models are more efficient: Electric ovens are 1.8 to 3.5 times as efficient as gas ovens, according to U. S. Department of Energy (DOE) data. Cost efficiency, however, largely depends on which type of fuel costs the least in your area. 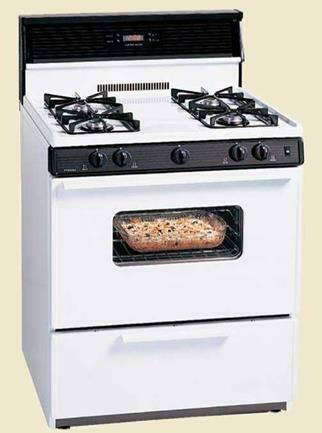 Most gas ovens also use a lot of electric­ity while operating. In nearly all gas ovens today, when the gas burner is operating, an electric glow-bar igniter (sometimes called a "gas oven igniter") is on, drawing about 375w. (Interestingly, at a recent International Builders’ Show, not one kitchen-appliance salesperson who was asked seemed aware of this fact.) Found in all self-cleaning models, the glow bar ignites the gas when the oven is turned on and reignites it as it cycles off and on during the cooking or self-cleaning process. Those 375w (or even as much as 500w in some ovens) are a significant amount of electricity. If low electricity use is a priority in your home, consider a model without a glow bar, such as ranges made by the Peerless-Premier Appliance Co. (www. premierrange. com), which operate with a pilot or a spark ignition. Cooktop efficiency is difficult to measure, and relatively little attention has been paid to it, primarily because stovetop cooking ac­counts for a small percentage of household energy use—about 5%, according to the American Council for an Energy Efficient Economy. My research shows that electric cooktops are the most efficient, and gas the worst. The section below ranks the most common cooktop technologies in order of efficiency based on the energy factor, which is the ratio of the amount of energy conveyed to an item being heated to the de­vice’s overall energy consumption. Expressed as a decimal, it reflects the proportion of energy used that actually contributes to the cooking of food. cooktops also heat up and cool down quick­ly, providing precise controllability. Down­sides include high cost and the fact that on­ly certain cookware can be used. Cast-iron, enameled cast iron, and some stainless-steel cookware work. Test yours to make sure a magnet sticks to it, or look for a label. Radiant ceramic The most common mid – to high-end electric cooktop today, it has rel­atively fast-heating radiant elements under ceramic glass, providing a sleek, easy-to-clean stovetop surface. Flat-bottom cookware is needed for good surface contact; older – style cast-iron pans are not recommended because burrs on the metal can scratch the glass surface. Radiant-ceramic cooktops heat faster than electric coils and are nearly equal in energy efficiency. Electric coil Available on low-cost ranges and cooktops, these old-fashioned open-coil elements are slow to heat up and difficult to clean, but fairly efficient at transferring elec­tric energy to the pot. and propane is essentially the same.